A series of temples along the Grand Circuit. A series of random thoughts. 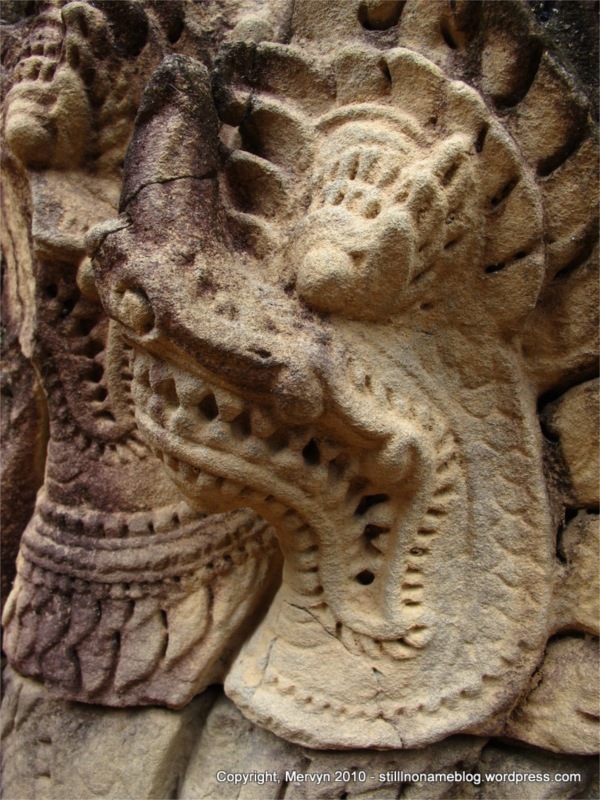 There is a long grand avenue at the east and west entrances lined with giants carrying giant naga (serpents). 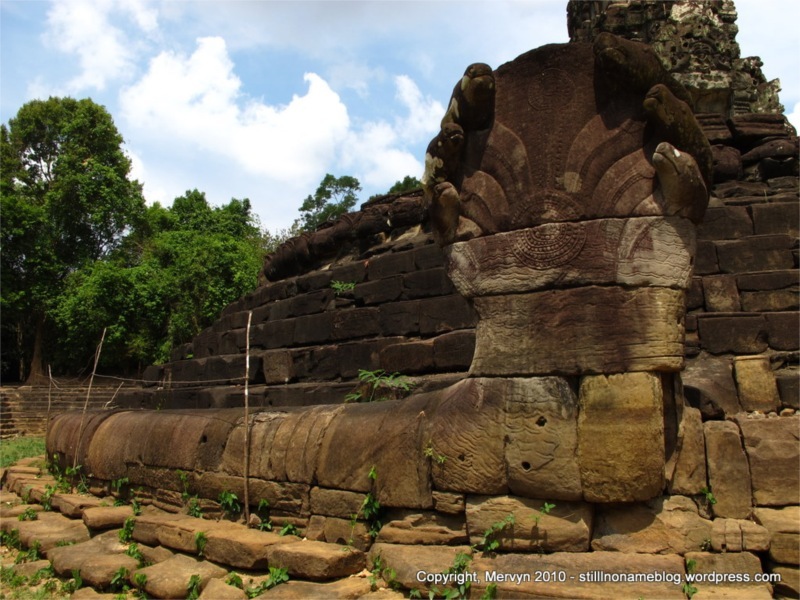 Like many other temples, there have been numerous additions and alterations throughout the centuries as evidenced by an odd mix of a Buddhist monastery and Brahmanic iconography. 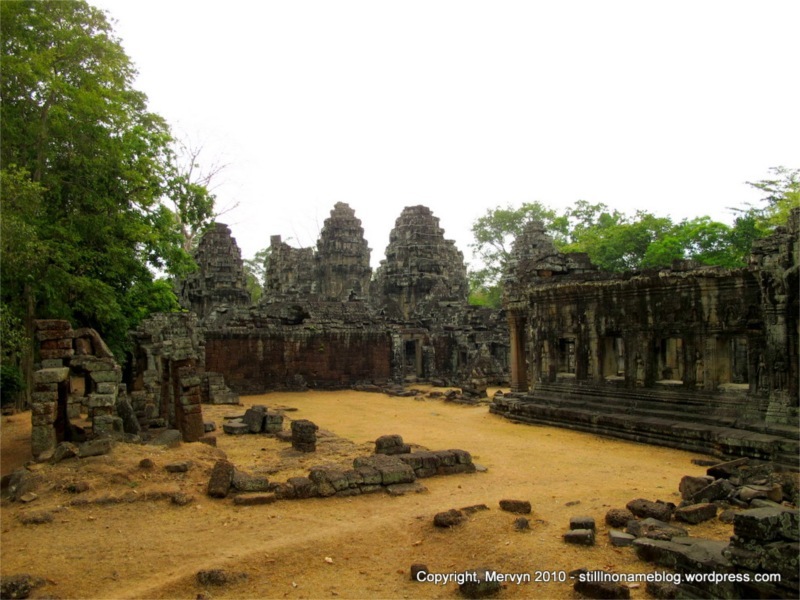 Built by the same king who constructed Bayon—it has the same towers with four faces scattered throughout the complex. 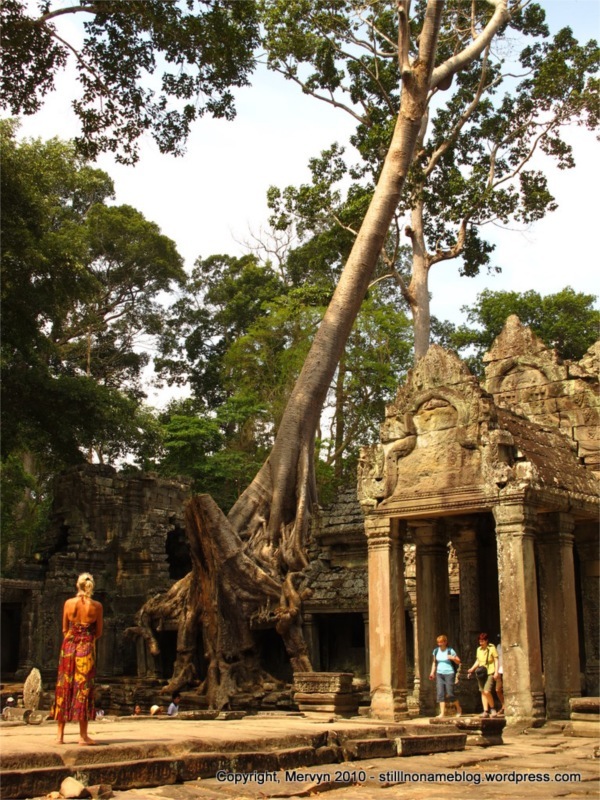 Tall trees have overrun parts of temple, much like Ta Prohm. I didn’t notice any swords. I also didn’t see any pandas, monster trucks, or little people. I admit, I wasn’t really looking. I know why Angelina Jolie has a thing for Cambodia. 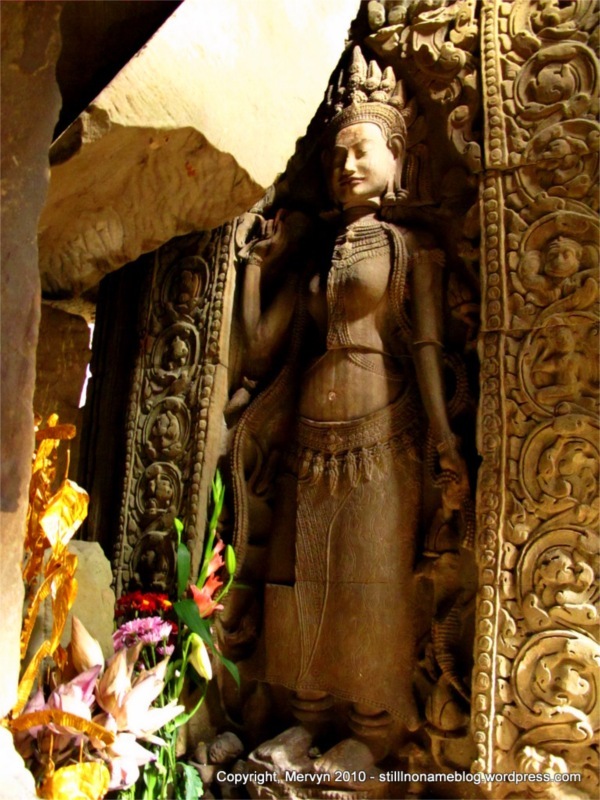 The American movie star first came to the country to film portions of Tomb Raider at the Ta Prohm temple and has been actively involved with the country ever since. At the beef and beer feast a few days ago, a Khmer noted two Americans that had done a lot to help Cambodia: Hilary Clinton and Angelina. She’s taken up the cause of clearing the country’s land mines, donated money for education, and even bought land in the northern provinces. She’s even adopted a Cambodian child. For her, Cambodia is no passing fancy, and I can understand. Okay, I made that last one up, but you wouldn’t be surprised, would you? To me, Cambodia is the Angelina Jolie of countries. 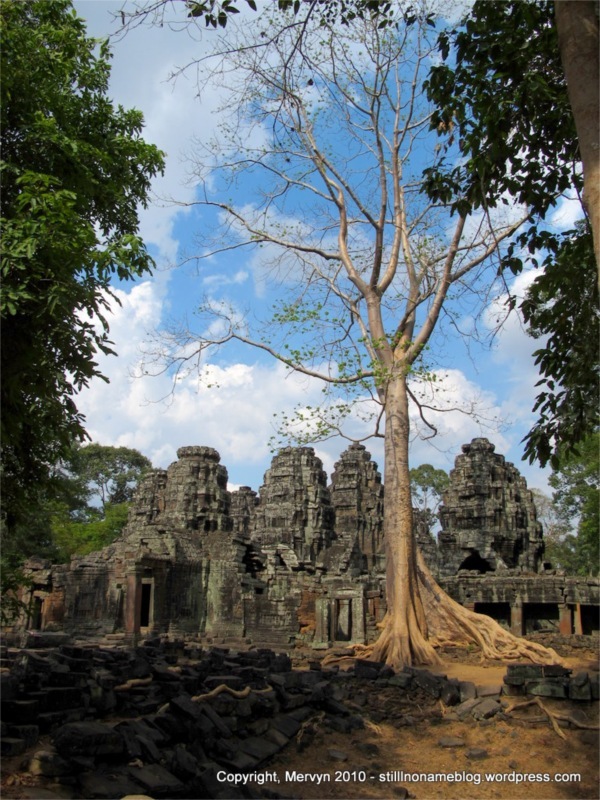 It too has a rocky past and is politely referred to as “complex.” The temples of Angkor evidence a glorious history. The past few decades, though, have not been kind. It was a secondary battleground in America’s war against Communism in Southeast Asia (i.e. the Vietnam War). The populace was ravaged by the Khmer Rouge, which, through its policies, killed over 2 million Cambodians in a country that currently has a population of 15 million. The last remnants of the Khmer Rouge only surrendered in 1998. The jungles are still littered with landmines from all the previous conflicts. And yet, this country continues to carry on with a palpable intensity. 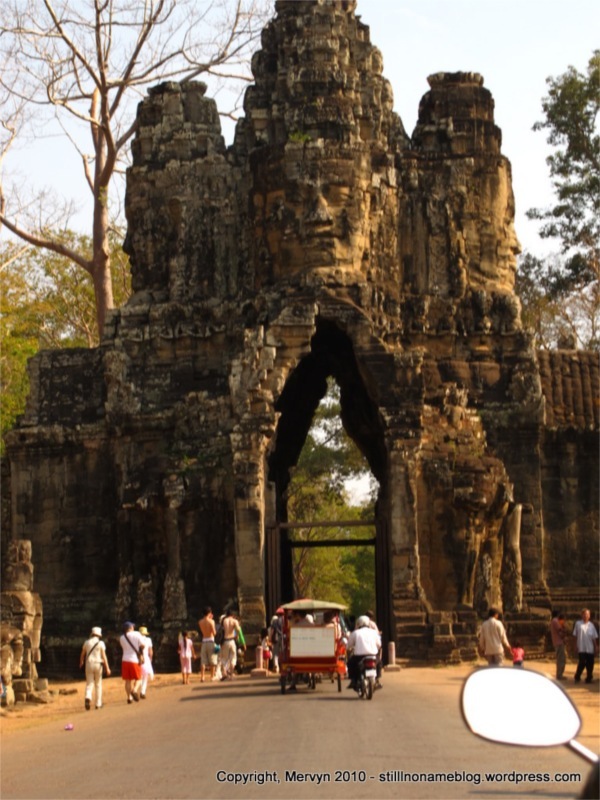 Like the vendors in Angkor, it feels like it won’t take no for an answer. In the face of a horrifying recent past, you can feel the country trying to right itself. The people seem friendly and laidback, but beneath the surface you can feel that they’ve got the hustle—like they’re taking in the situation and figuring out how they can use it to make it through the day. There’s an energy here, that’s hard to place. I feel like I could stay here a long time and still not understand it. For a woman as contradictory as Ms. Jolie, it’s no surprise she’s taken a shine to the place. I have a feeling she sympathizes with its complex history; a history that often means that it’s misunderstood. All that, and Cambodian kids are some of the cutest kids in the world. Makes you just wanna get one or two of your own. 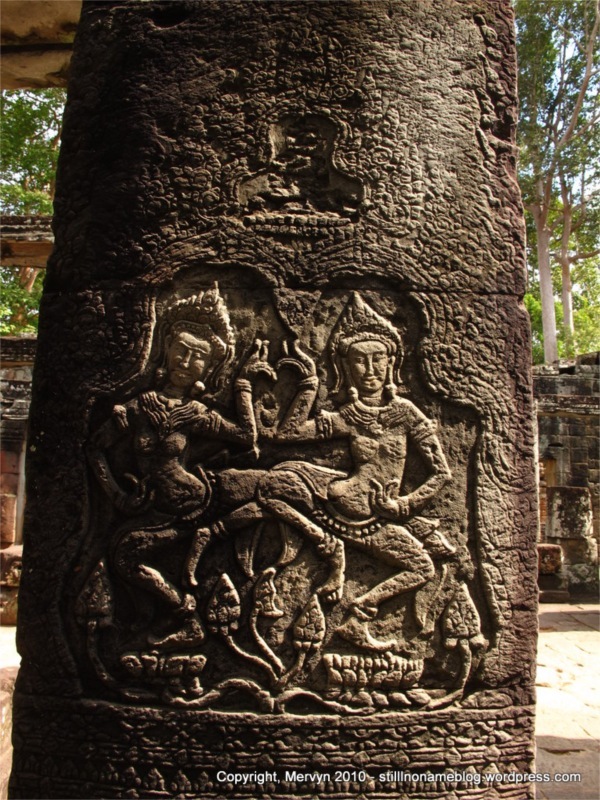 This is a shrine depicting the marriage of two serpents. The shrine sits in the middle of an island and is surrounded by four now dry pools. 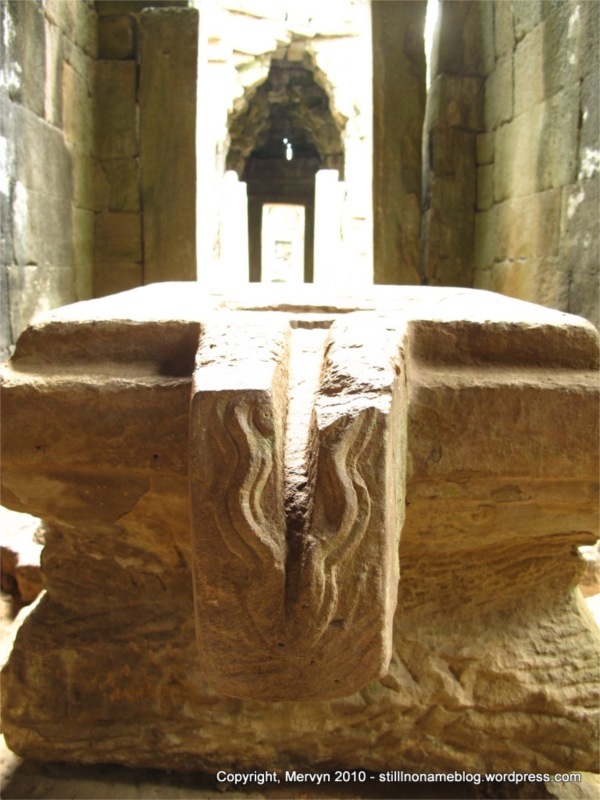 The tails of the two naga are intertwined with one serpent surrounding each side of the island. There is a gap between the heads of the serpent where one can ascend steps to the top of the shrine. In the rainy season the pools fill with water creating an enchanting atmosphere. Or so writes another writer. I wouldn’t know. I visited during the dry season. There was no shade. It felt like me and the busload of Chinese tourists were sitting under the gods’ heat lamp. I wouldn’t have been surprised if a giant hand had reach out of the sky, snatched up a bunch of us, and put us in a “to go” box. 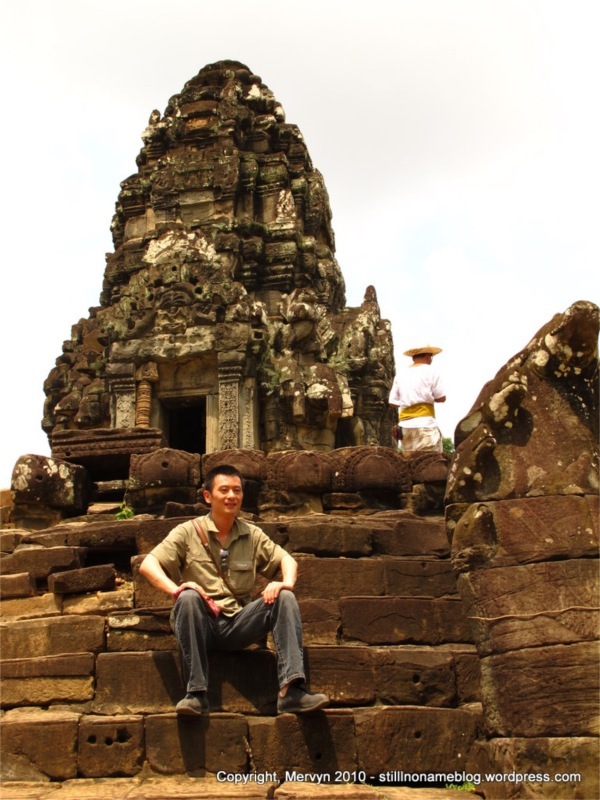 You’ll notice that, since arriving in Cambodia, I haven’t talked much about the food. That’s for a good reason. I think Thailand broke me. I haven’t come across anything I’ve totally loved when it comes to Khmer cuisine. It seems to have less flavor to me. I think it’s because I spent over a month eating Thai food, which has a myriad of spices and chilies. Even the food in Penang, Malaysia had more kick. Much of it was rooted in Indian flavors, which aren’t exactly subtle. Even the Khmer beer and beef feast from a few nights ago was more about the circumstances than the food itself. The beef was just semi-raw strips of flesh cooked over a flame. The sauce was a little spicy, but the flavor wasn’t anything to write home about (literally). It could also be that I’m just missing something. I will continue to explore random foods and see if I can come up with something interesting. A smaller monument. 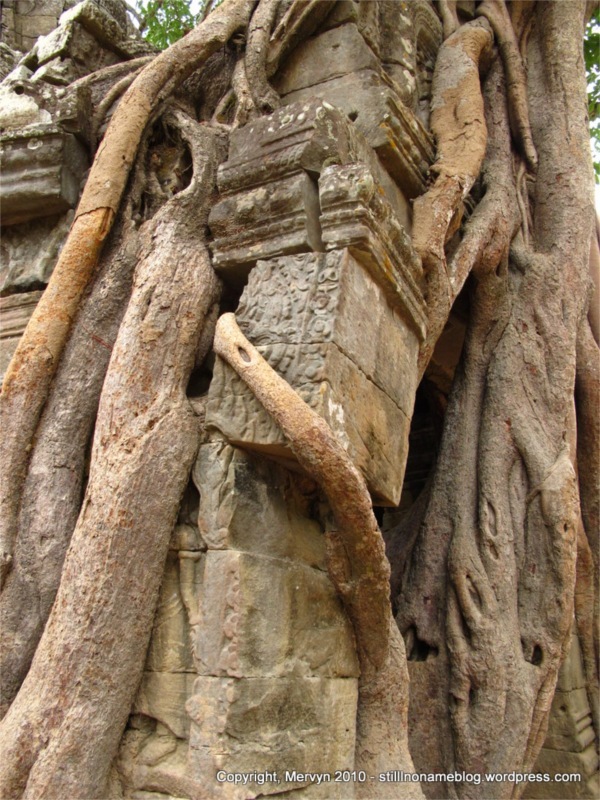 A giant tree has taken root over the eastern entrance, just in front of a tower with Lokesvara’s four faces. 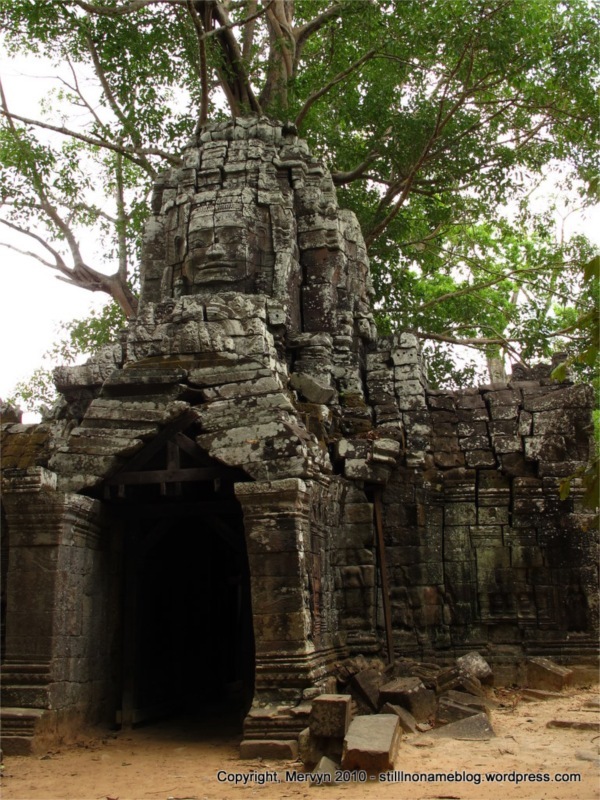 This temple felt like a cross between Bayon and Ta Prohm. You had the giant Lara Croft trees combined with the four-faced towers. It also felt like this other temple that had stones and vegetation. 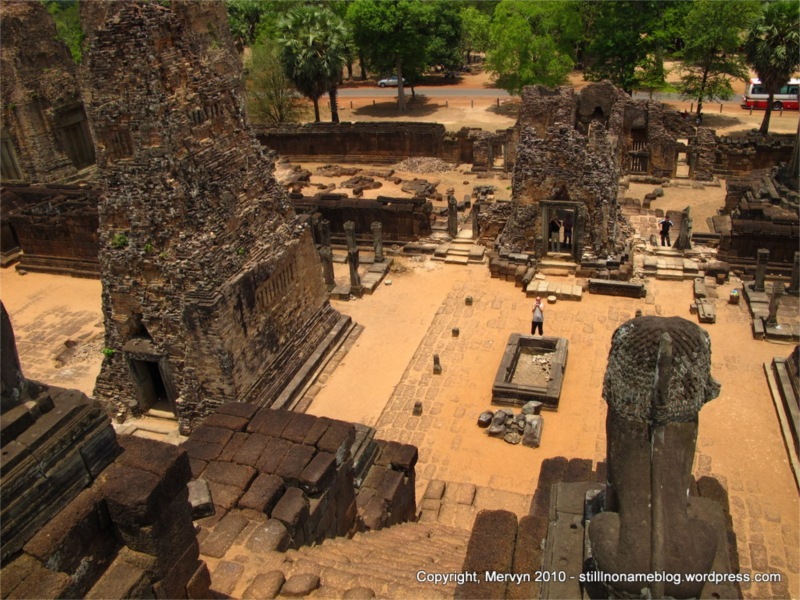 I think it was in Angkor too. There was this other temple too that was old and falling apart as well. I’m pretty sure I visited this temple. I’m confused. I see ancient ruins. I’m getting better at taking pictures of buildings. Compared to my struggles in Penang, Malaysia I think my pictures these days are much better. That’s especially true for temples. I’ve learned that patience is a photographer’s best friend, especially here where the sites are crawling with tourists. To get a nice shot, it sometimes means sitting in the shade waiting for the busload of Koreans to roll out. Looking at the first day at Angkor and today, I can see that I’m improving. 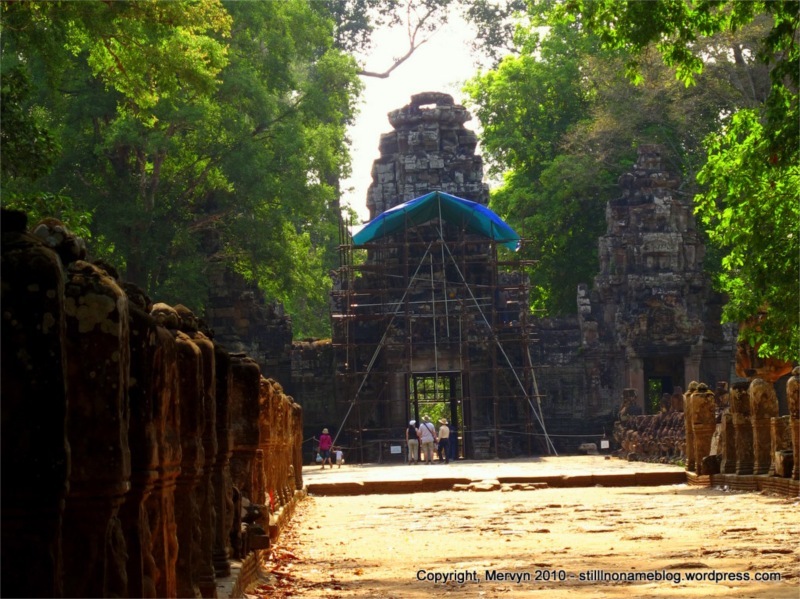 I even went back to Ta Prohm (the Tomb Raider temple) today to reshoot some stuff. I even got a pic of the giant tree over a doorway without a chesty blonde walking in. I’ve also noticed that I’m not the only photo-dork out here. There are guys (haven’t seen any women photograph-philes) with elaborate set ups. Backpacks with multiple lenses and hoods. Vests loaded with photo gear. One guy had a camera on a tripod, another around his neck, and a bag full of accessories. I don’t know how these guys lug all that crap around. Today, it was so hot I struggled to not sweat on my little handheld with my fingertips. This is a Brahmanic structure built in the “mountain” style. 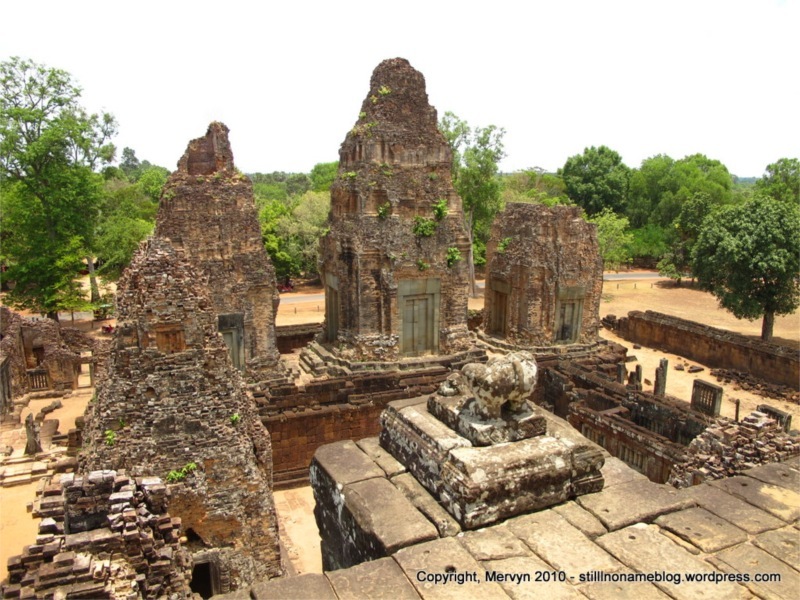 This temple is part of a series of temples erected in honor of deified parents. I just plan on putting mine in the best rest home money can buy. 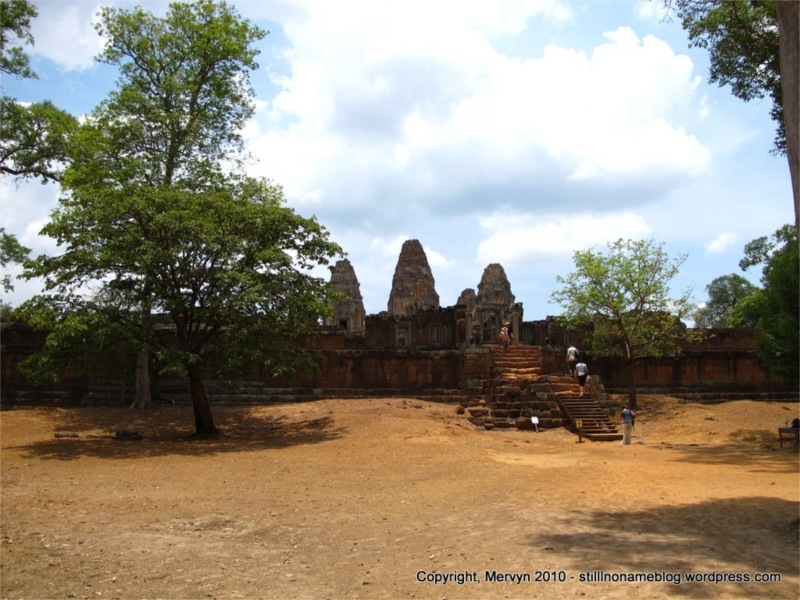 A Chinese chronicler who visited Angkor in 1296 said that the “inhabitants are coarse people, ugly and deeply sunburned.” This is day three of wandering the temples. I don’t see coarse, ugly people. I do sympathize with the “burned by the sun” description. That’s because I now have a spectacular shirt tan. All those days in the Thai islands gave me a nice even color. No longer. There are now three shades of me. The only time I look darker than one of those shades is when you turn out all the lights on a moonless night. No skin cancer though, assuming that this “Ultra Sweat Proof” sunscreen can stand up to my sweat gland onslaught. There’s some serious doubt to that, too. I drank a liter and a half of water today while doing the temple circuit and didn’t feel the urge to pee once. I think I’m urinating through my skin. That reminds me, maybe I should do laundry tonight. Made primarily out of warmer colored materials (laterite and brick) this temple has some fine colors. 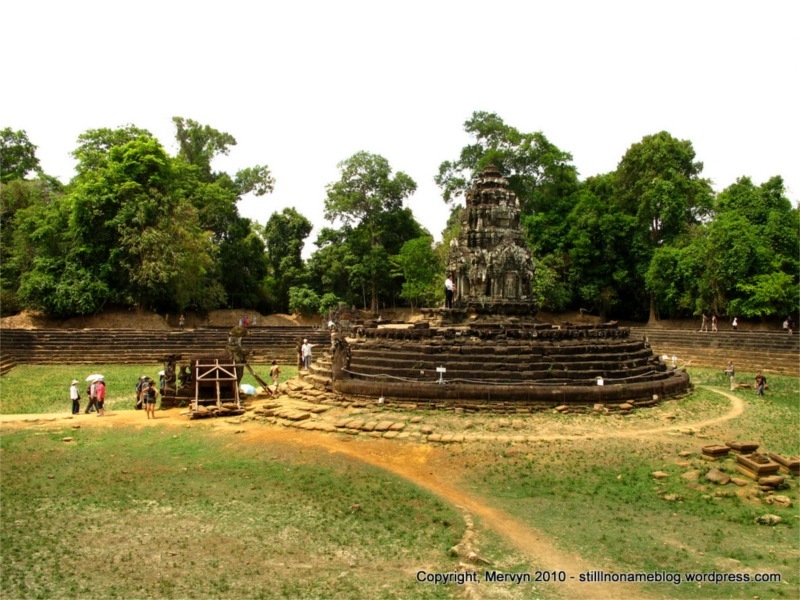 Built in the style of the “temple mountain” this Brahmanic structure is a three tiered pyramid topped with five towers. The walls used to be covered in limestone plaster. Legend has it that the site was used in cremation rites. “Turn the Body” refers to turning the corpse in the funeral pyre. Other than at two stoplights in town, nobody here stops at intersections. Not trucks or motorbikes or cars. They slow down then just slowly not crash into each other. My tuk tuk driver, for instance, came to a “T” intersection this morning. The cross traffic was thick and moving briskly for Cambodia. He slowed down a bit, rolled through the cross traffic, and crossed to the far lane as he made his left turn. Everything seemed to go all Matrix–all the cross traffic slowed around him and he didn’t really break stride. I think this only works because everyone understands that when you come to a cross street, you have to keep an eye out for merging traffic. Also, no one really goes much faster than 40 km/h in the city. It could be too that no one cares if they live or die. Since I’ll be in Cambodia for at least another week, I’m going to pretend that that one’s not true. Maybe all Khmer are telepathic and telekinetic—they can communicate their driving intentions to all around them and, if need be, move objects out of their path with their minds. Yeah. . .I like that one. I feel much better now. 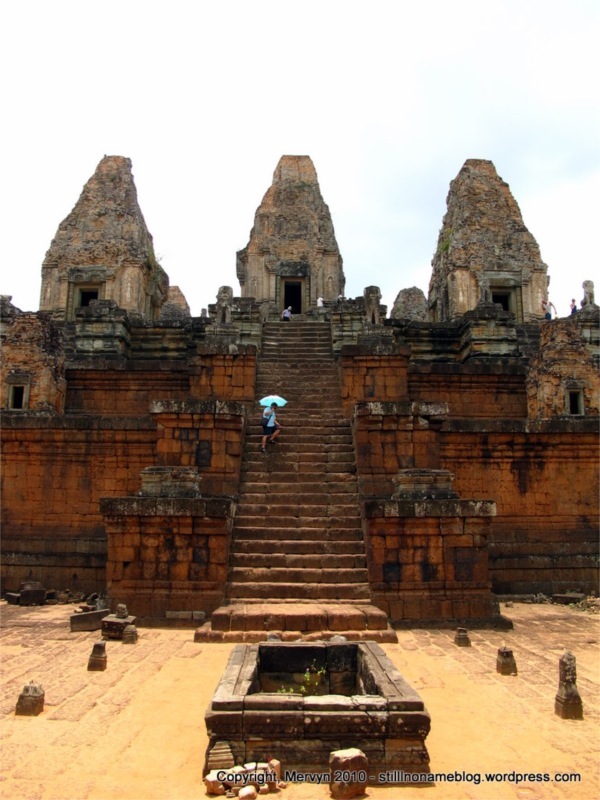 A low-lying temple that, at its highest point, is three stories tall. It’s a mix of Buddhist and Hindu iconography. 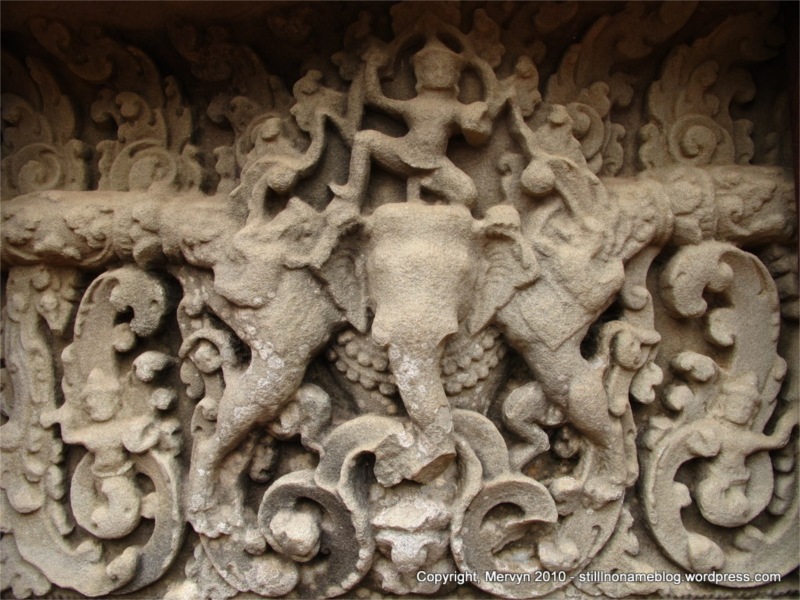 Hindu images have been drawn over Buddhist ones. There used to be statues of Buddhas attached to the walls but they’ve been removed. 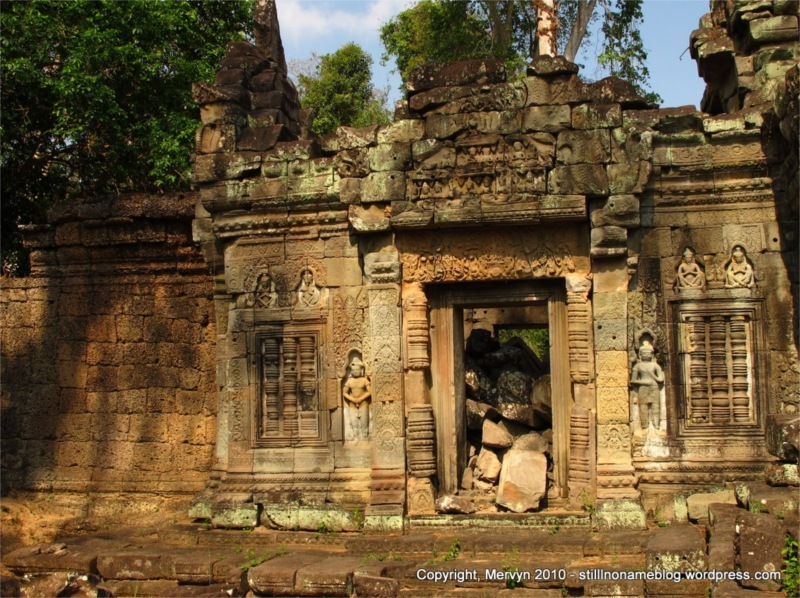 A lot of the artifacts were looted by the Khmer Rouge and sold on the black market. Part of their eradication of all religion or something. 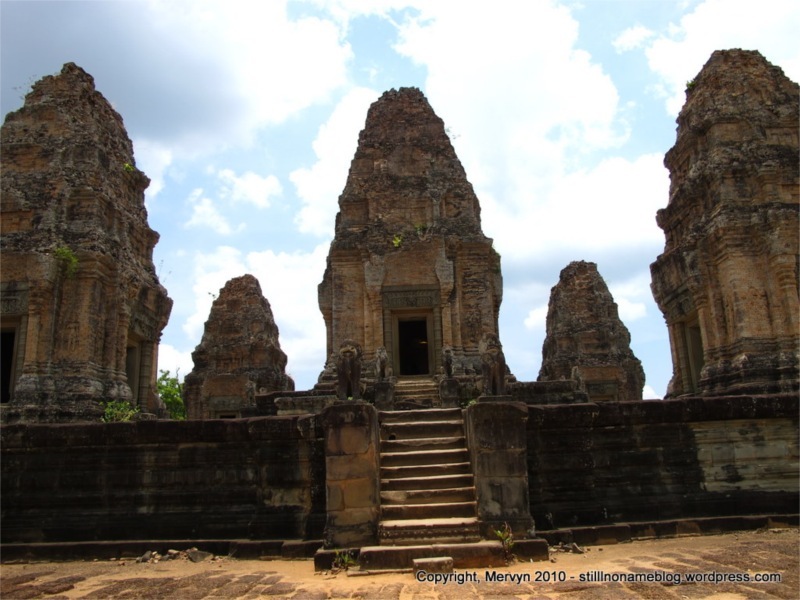 Much of the temple was destroyed by the Khmer Rouge. Apparently they used it for target practice. I can see why. It’s not like there was anything else to shoot at like jungle, trees, or dissidents. It’s all kind of blending together. I don’t have “temple fatigue” but I am having a hard time distinguishing between them. 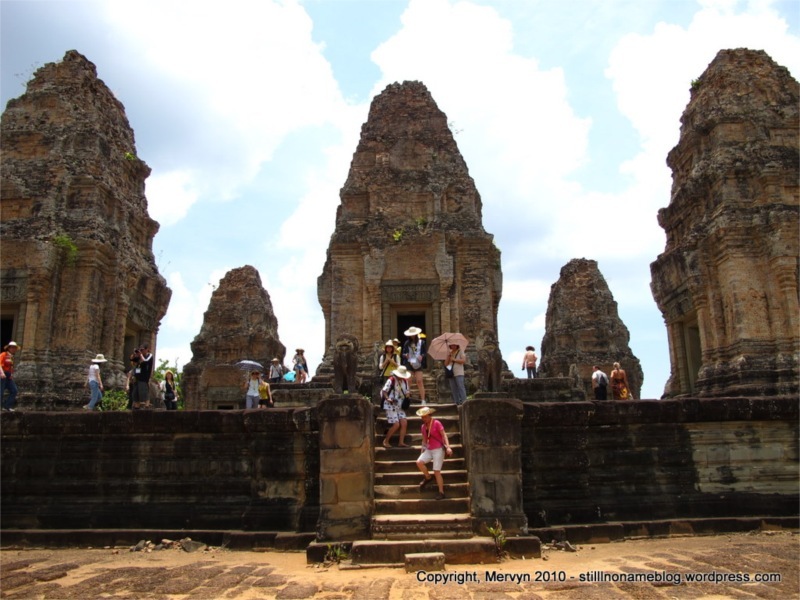 For instance, I was going through the pictures for today’s entry and I got confused about what temples I’d visited. Usually, I try to take pictures of signs so I can know what I was just photographing. For two temples I didn’t. All I know is that they were both on the Grand Circuit. I had to read the guide three times to figure out which temple was which (came down to the height of the pedestals and the schematic overheads, which were less helpful than you’d think since most temples have similar layouts). It’s possible that I still got them wrong and I could suffer great humiliation at the hands of a temple geek. I’m counting on reader apathy. Click here for pictures. 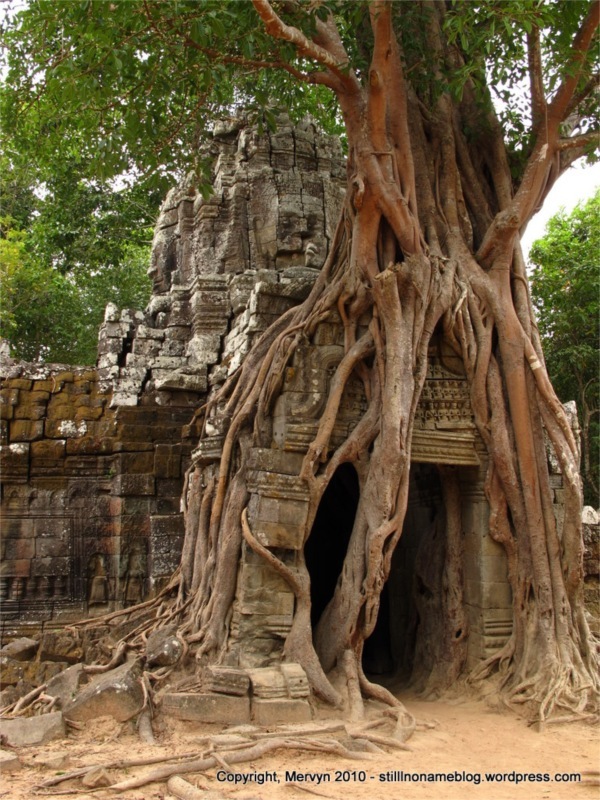 Including new pictures of Ta Prohm, the Tomb Raider Temple.